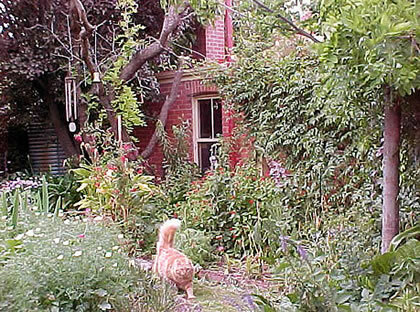 Editor’s Note: Sara lived and gardened at Ashcotte in Bendigo before she moved to Nonsuch in Tasmania in early 2005. We have added the pages from her time at Ashcotte which originally appeared on her personal website and her Victorian Flower Garden website. 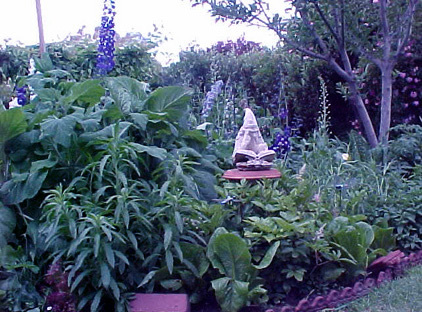 Here are some pictures of my garden – they were taken in November 2001 with my digital camera, which has given up on its long battle with chronic blurriness. Next lot I will take with my ordinary camera. 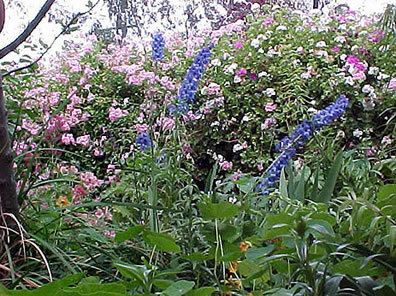 2) The blue spikes in the back ground are Pacific Giant Delphiniums. 3) The plants surrounding the plinth on which Merlin sits (Merlin was a birthday gift) are astilbe which are only just coming into flower. 4) There are are a couple of Cos lettuce in the foreground and a tomato plant to the extreme right (just under the apple tree). 5) the immediate plant in front of the giant sage is possibly a variety of daisy. I can’t remember exactly what, so it will be a surprise! 6) There’s an oregano plant to the extreme right by the border tiles. This somewhat blurry shot is looking at the kitchen window of Ashcotte (if you look very carefully through the window you can just see the mantelpiece of the kitchen fireplace). Immediately to the right is the end of a very large pergola that runs some thirty feet across the back of the house. The back garden is raised – all paths in the back garden are brick paths sunk so that the flower beds are about hip height. There’s the trunk of a Wisteria tree to the right (wisteria vine covers most of the pergola, but you can’t see it in this shot … most of the vine visible is a pink trumpet-shaped flowering vine whose name remains a mystery to me). There’s fuscia and iris and Californian poppy and lilies, none of which are really visible because the shot is so blurry. But Martin -the bestest cat in the world is visible -and he thinks you have some food, so watch out, here he comes! This is (another blurry) shot that shows the mess under the side apple tree. Blue giant delphiniums, lilies, agapanthas, nasturtiums, winter iris (not looking good because it isn’t winter) and the side fence which is smothered on both sides for its entire seventy foot length in pink and red and white climbing geraniums – it is a real feature of the street to the side of the house. Here’s the fish pond. Size is difficult to tell here, but it is about 5 foot wide and about 10 long. The photo was taken from under the pergola, so that’s wisteria drooping down, there’s the unkillable Valerian (Kiss me Quick) to the extreme right – I’ve seen these pink flowers growing deep inside the crater of a very active Mount Vesuvius … trust me, they’ll grow anywhere! To the extreme left, upper corner, there is a brief orange flash that’s the tip of a Bird of Paradise flower. This is a raised pond, the sleepers in the foreground are about hip height. 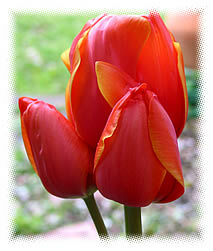 The picture to the left is one of the many double, triple and quadruple-headed tulips that grew for me last winter (2003). This year I’m aiming for at least five heads per stalk! Visit some more pictures – taken in 2003, a couple of before and after shots of the back garden, taken in 1997 and 2002, and a gorgeous painting of me in the garden done about 3 months ago. Soon I’ll add some more pages – or at least tidy these up. Oh, and here’s another picture of the front gate which has now featured in several gardening magazines in the USA – Roland’s Paradise Gate.